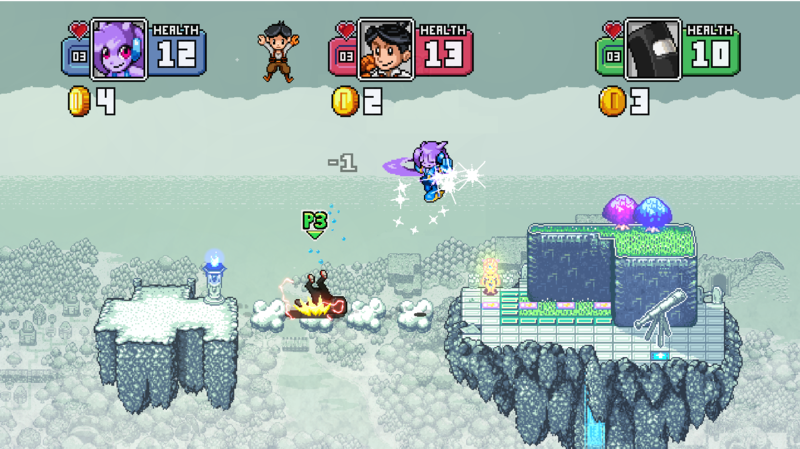 Indie Pogo, from developer Lowe Bros. Studios, is not only a love letter to Nintendo fighting institution Super Smash Bros. and similar brawlers, but is also the ultimate indie game collaboration; it features characters from many popular indie (and 'Nindie') games. The Kickstarter for the project is well under way, though sadly its Switch stretch goal is still some way off; at present the GameMaker engine isn't supported on Switch, which means it'd need to be ported to a new engine unless that scenario changes. As Indie Pogo features so many characters and IPs familiar to eShop gamers, however, we just had to know more. We took the chance to talk to the masterminds behind such a bonkers yet gloriously ambitious project. First of all, congratulations on the reaction to your kickstarter project, Indie Pogo. Oh, hey there! Yeah It's been incredible. It definitely justifies the last 3 years of development! How has the development process been so far? Honestly, it's been somewhat of a struggle. Not the development on the game itself, but situations in my life that have happened as a result of me deciding to go indie. You sacrifice a ton of stuff in order to make these happen, independent of a publisher, such as a stable career and many of life's finer things. That said, I wouldn't do anything differently if I were given the chance. No regrets. What attracted you to develop a game with such a wide variety of characters? I've always been somewhat of a collector/completionist. When we decided early on to make it a crossover, it's in my personality to strive towards having ALL the best cameos. So far, I'm pretty happy with the one's we've got! Funnily enough, it wasn't always meant to be a cameo crossover. It was meant to be a marketing platform for our own games where we would retroactively add new characters in with each release. That's why Stardrop is a playable fighter. We can see there may be a few aesthetic and technical Influences. Was there a particular aspect of the game that was the focus or did everything come together organically? I was primarily influenced by 4 games: Slambots (iOS) was the first. It's an autojumping arcade platformer that I played and thought "What if this were multiplayer?!" The humorous tone and retro art style is very much inspired by Legend of the Mystical Ninja (SNES). As we developed the basis for the engine, we kept saying "this feels like it needs more X to make it competitive" which where the obvious Super Smash Bros. inspiration comes into play. And the simple movesets that have communicative functionality stems from my unhealthy obsession with League of Legends!. I learned a design process in my time at Zynga called "The Onion." Basically, it means you don't develop ANYTHING until the base is solid. For us, that was autojumping. That meant we narrowed in on gravity/momentum, landing squish, dust particles, collision, jumping/landing sound effects, etc. And then you build out naturally from there. So we added a second instance of the prototype character and focused on hitstun, visual effects, head-jump, sounds, knockback, facedown state....all before ever looking at attacks, character traits, weight classes and more. You essentially build in layers, and this gives a great result because you're not building up incomplete systems with the intention to fix things later. In game design, that's like building a house in quicksand. Since the announcement of the kickstarter, it's been incredible to see the reaction from fans and devs offering support and contributing IP. How has it been for you? It's honestly been so vindicating. I've had movesets planned for some of these newly recruited characters for years. Keep in mind, I'm a HUGE fan of these characters and worlds, otherwise I couldn't justify including them. It's also nice to see that the social connections I've carefully built have been paying off. It almost feels like we're in the center of a big indie network. I think it's been a good time for many people involved! Not only has the reaction been (rightly) fantastic, but seeing the roster increase 'in real time' on social media is pretty uncharted territory. That must be exciting. It's funny you should mention that because I was thinking the exact same thing. I can't think of another instance where a project has expanded so rapidly in such a public manner. We're definitely doing things nobody else has done before and it's easy to forget that in the heat of the moment. We get compared to Super Smash Bros. a lot (and I definitely stoke that fire) and I think there's a natural tendency to advertise character reveals in a similar way. But we're doing our own thing, regardless of what Smash or other indie crossovers are doing. I think that's important in order to maintain our identity. Also, the sense of community amongst indie developers is unprecedented. How has it been making these new relationships? It has definitely gotten easier lately. We're finally able to ride on the momentum we worked hard to build. There have been quite a few times when a studio or developer has given us the hookup with another studio. I try not to ask for that until I've proven we can implement their character/world in a way that's faithful to the original. I think that's an important thing when building trust: to gain respect, one must respect their counterpart's work. With little to no characters initially, how did the look of the game start and develop? I think that the best word to use here is simple. And that was part of the reason we were able to make a strong foundation. We had to make something unique and polished in order to appeal to some of the more famous studios. I think if we had started out with all the flashy characters and well-known IP's the game would be very different at it's foundation. I've always said, beyond anything else, I just want to make a good game. And then I want to make a good indie crossover. Because you can have the best graphics or all the famous indies in the world, and nobody will care if the game isn't fun. There is of course one game above all others that the game resembles...! If you're referring to Super Smash Bros. I obviously see some similarities, but by no means are we a clone. I don't think it would have done anybody justice to simply clone Smash and call it a day. That would have been easy. We want to be memorable. Does the team have tournaments?! We've never done any public tournaments, although we usually have a crowd of players who like to stay at our convention booth for hours and compete! Internally, my brother and I testplay everything in detail. That's how I'm confident we've made something fun. He's my rock in many ways, even though he's only a part-timer on this project. One of the stretch goals is to get the game onto Nintendo Switch. Indie Pogo seems perfect fit for the system. I am heavily influenced by Nintendo games in my art style and game design values. So I think it's natural that the game I create as a result would fit there! Are you excited about potentially working with Nintendo? I SINCERELY hope Yoyo Games and Nintendo can allow GameMaker to port to Switch. I've owned every Nintendo console since the NES. That would be an absolute dream come true for me. What games influenced you growing up? Super Mario RPG: Legend of the Seven Stars (SNES) is still one of the best games I've ever played. It has a way of being so much more than the sum of its parts. That and The Legend of Zelda: Majora's Mask are games I think about often. But I let myself be inspired by many mechanics from many games. It's hard to pinpoint them all. Have you got a Switch? If so what are the games you are playing? Personally, I've not been able to afford one, but I've played more than enough Breath of the Wild on my brother's Switch. Once this Kickstarter is done, I may splurge so I can study the market! My brother and I sincerely loved Snipperclips as well. I'd love to see that in Indie Pogo. What was your interest regarding the rumours and announcements around the NX (Switch)? Well the only rumor that keeps my interest are the whispers regarding GameMaker porting....And I'm certainly curious to see if Nintendo will port Smash to Switch. I'd be shocked if they didn't. Have you had the chance to look at the Switch's unique features/ have they been experimented with? I haven't spent too much time with a Switch. I hear HD Rumble is pretty neat. Nothing jumps out at me as being so revolutionary that my next game would have to be centered around. But I love that it can be portable and a console. There's definitely some interesting game design possibilities to come from that. All the best for the Kickstarter campaign. Thanks! Keep a weathered eye on that pledge! We're over half way! You can follow the project's progress over on its Kickstarter page. This seems pretty awesome. Needs Scram Kitty, Shantae, and someone from Trine. I'm not liking the pogo aspect. I think I'll stick with smash bros. I can see some nindies having characters in the next smash anyways. Looks interesting, but I think they should have been working on this before that other Smash-ish game was announced. 300k Switch goal? Good luck so. It's the idea I always wanted, but not the game I always wanted. I wanted to see this idea in a game like Brawlout. It needs to have that Smash gameplay. Love the characters, but the game doesn't seem to interesting. Game looks like a blast to me. I was on the fence until I saw a Let's play, now I'm sold. The problem is it's hard to back this without a Switch version guaranteed. With the lack of Gamemaker making me even more skeptical this would ever happen. Therefore I can't see myself backing it. If it does get funded though, day one buy. Been watching this one for over a year now. Really hope it pulls through! @TheTetrisGuy - Bounty Brawler on Fig is similar to this, only way we see indies in Smash. Funny thing is a few indies starring in either of these games has characters from games not even entirely funded yet (Blubber Busters naming one). I had not heard of this until now. Not looking good that it's only two thirds of the way there and has 10 days left. Hoping it makes it though! I LOVE the idea of a crossover brawler with all these indie characters. Like the developer, I'm a completionist and collector, so crossovers always appeal to me. Not sure why Indie Pogo is being funded on Kickstarter and not IndieGoGo. Seems like a no-brainer to me. It really seems like they're aiming far left of the bullseye here. Nintendo fans would be the most passionate supporters of a game like this. Looks better than Icons already. Wouldn't of been a hesitation to support if quote was in it... sorry no cave story no immediate buy! I hope they can get the full Runbow cast in this. I'd love to see Rusty, Gunvolt, and Shantae playable! @NImH If Game Maker can support Switch for distribution then it can be done. But Game Maker does not support Switch yet, so they can't just simply add it straight away as a higher priority. I thought this game was supposed to be named Indie Brawl. Well, Indie Pogo it is, then! Gotta get Rusty and Shantae. I need some familiar faces outside of Lilac. Anyways, I welcome any Smash Bros clone regardless, especially one that encompasses each and every indie character throughout gaming history (especially Shovel Knight, Quote, Shantae, Gunvolt, Juan Aguacate, Gunvolt, Beck, Zizou Olympia, etc). What I'm seeing in Indie Pogo is...not good. Lowe Bros Studios got the Smash mechanics down and I like that, but despite its name, why does every character HAVE to Pogo Jump? Why can't we just fight normally like we would by staying on the ground, as well as walk or run? Uniqueness is one thing, but this just turns me off. I mean, it's nowhere near as bad as the Super system from PlayStation All Stars Battle Royale or even the tripping feature from Brawl, but it still looks like a feature that won't hold me for long. If Shovel Knight couldn't be in smash 4, at least we have this. So yeah where is Quote or Curly from Cave Story m8? I know 6 characters from both the cast and cameos (as in i know 12 in total) never heard of the rest of them, so there not that iconic or I'm not keeping track of most indie games, or a little bit of both. I'd be more interested if they didn't have that Pogo mechanic. So glad this hit it's funding goal. I'm seeing lots of negativity here. Jumping mechanics or unknown characters aside, this is super cool to have this big of a collaboration between these indie studios. Supporting this feels good. It was partly inspired by Mystical Ninja?! If Goemon made it in, I would buy this in a heartbeat. I know he's a Konami character and all, but it's not like they have cared about him in the last 12 years. Shantae isn't in this, though, so...Shantae confirmed for Smash 5? Hmm, I like the idea but think the game doesn't look that hot. On a sidenote: Wouldn't surprise me if Nintendo adds some indies themselves to their own Smash, the real Smash. Hopefully they won't sacrifice some "retail" third-party characters for that though (Sonic, Megaman), but a few indies could be fun. Runbow, Rivals of Aether, Shovel Knight... I'm interested.